I will start off this post by saying it is HARD to get a house organized when there are people under the age of 18 living in it. I would also like to add it is near IMPOSSIBLE if you have children AND a husband living in it. I drool over pictures of neatly organized homes. And I nod my head when a fellow blogger reveals the "other side" of pictures...you know, the side the camera didn't catch! That's real life folks! I am not consumed with organizing to the point that I have or want lists of the items I have...I just want to see neat and orderly, and maybe things labelled. If they were labelled, would the kids (and hubby) abide to the labels? Maybe if I jumped up and down screaming and hollering enough? I just don't know.... As I ponder that "would they" question, I found some labels that are FREE to download and/or print! You can buy blank labels at any store that sells office supplies. Or can do like I do, and purchase sheets of sticker paper. This allows me to print any size or shape sticker I want and not fight with set the computer to print a certain size, format, and direction. Better Homes & Gardens has an entire gallery of free printable labels, most of which are editable! Some more pantry labels from Domestifluff. 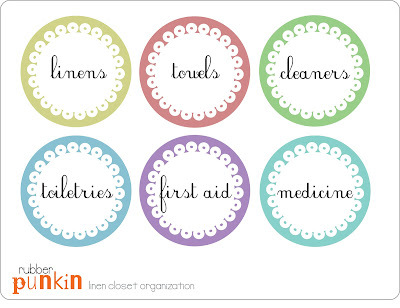 The Rubber Punkin has some great labels for your pantry, closet, and kids/toy rooms! Spark Picks offers some great Craft Container labels. You can also find a huge assortment of free printable blank labels on the Internet. Just search "free printable labels" and get lost in the variety of labels available.